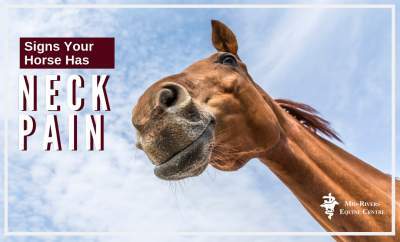 If your horse had neck pain would you recognize the signs? Experienced horse owners and professionals are acutely aware, and can often quickly recognize, limb lameness. Neck pain may be less apparent, and definitely less discussed, but can equally affect performance, gait, and overall health. Diagnosing the cause of neck pain can be difficult due to the complex anatomy of the neck and availability of advanced diagnostic equipment. When tracking down neck pain, your veterinarian will begin with a physical exam, which likely be followed by radiography and ultrasound. When these fail to reveal the source of pain, advanced diagnostics like CT scanners and MRI machines are required for 2D and 3D imagining. Unusual head carriage; it is tilted to one side while trotting, won’t lift head or lower head beyond a certain level, etc. Neck issues may appear as though they are becoming more prevalent. In reality, neck issues and injuries are likely under diagnosed due to a lack of imaging equipment for horses and not being on an owner’s radar like other lameness and health issues.